A little something for lunch. During the Summer, here in Toronto, there’s a Farmer’s Market on a Tuesday afternoons in the Trinity Bellwoods Park. I popped in a week ago and bought all sorts of fresh, seasonal and organically grown produce. Stuff thathasn’t been sitting in a van for a day on it’s way to a store, stuff that hasn’t been packaged in useless, throw-away, environmentally infriendly packaging. Despite the fact that today’s show was rained out by a tremendous, cleansing thunderstorm, I had wanted to make sure I had used up all the remainders before restocking. 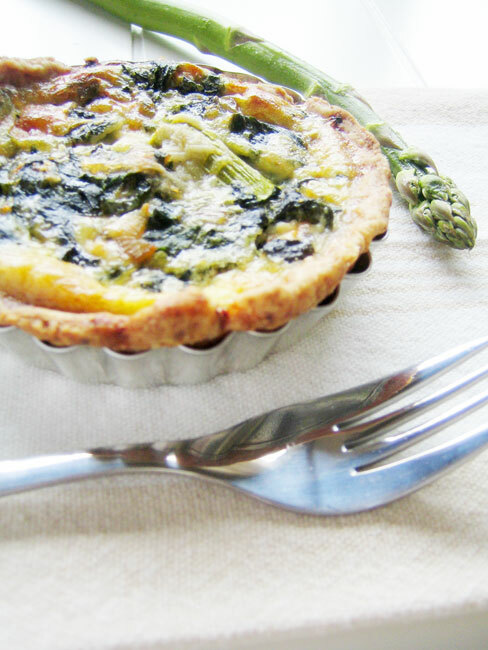 Voila, a gorgeous, easy little set of quiche-style tarts to eat for lunch, or a starter for a Summer picnic in the park. -Heat oil and butter gently in a skillet and sautè onion and garlic until translucent, about 5 mins. Add spinach and thyme and sugar and cook another 5 mins until soft. Let cool slightly.